I’m not dead, I swear to you. Things have been a bit hectic the last few weeks and I haven’t had time to mix up many cocktails. That said, I will be back mixing in the coming weeks. I’ve got a couple more reviews coming your way this week and the drinks will continue flowing the following. Drink well, my friends. I’m a day late in getting this one posted, but I think it’s still really fascinating. Everyone knows (or at least should know) that George Washington was the first President of the United States. As one of our founding fathers, a truly amazing military leader and successful businessman, there are lots of things to be impressed with in Washington’s history. All those things aside, did you know he was also a prolific distiller and made some great rye whiskey? I had heard the stories told, but had never really paid much attention. At the time nearly everyone with a farm distilled. It was a simple way to use extra grain, get some liquor for your personal consumption and maybe make some extra money on the side. Washington took it to the next level, though. He had a huge distillery and produced a massive amount of whiskey. I got an email last week from Reason.tv pointing me to a video they’d produced about the historically accurate and operational distillery at Mount Vernon. I’ll let their words and video speak for themselves, but I’d highly suggest checking it out. It is pretty amazing the process they went through and the quantity they were able to produce. Many know George Washington as a general and statesman, but few think of America’s first president as a preeminent entrepreneur, operating the most successful whiskey distillery in the late 18th century. At its height, Washington’s distillery produced over 11,000 gallons of liquor a year, supplying the surrounding area and becoming one of his most lucrative business ventures. At Washington’s former plantation, Mount Vernon, a group of historic interpreters are looking to bring this story to a wider audience. Thanks to a fully functioning replica of Washington’s distillery (and special dispensation from the Virginia General Assembly), George Washington’s rye whiskey is once again being made and sold to the public. In November, Reason.tv followed the entire process as Dave Pickerell, Master Distiller and former Vice President of Operations for Maker’s Mark, and Steve Bashore, Mount Vernon Distillery Manager, oversaw a two week production run while adhering as strictly as possible to 18th century means and methods. The result is an 80-proof reminder of the nation’s first president and the entrepreneurial ideals of colonial America. While I still rarely choose a beer over a cocktail, there is another fermented beverage that calls to me. Cider, my friends, is my fermented beverage of choice. For a cider fiend like myself there is a siren song above all others; uncharted ciders draw me to wherever they may be. My buddy Conrey sent me a message in December to rub in the fact that he was enjoying a delicious cider that I’d never heard of. Not wanting to be left out, I emailed Crispin Cider (the cider maker) to find out where I could procure the same tasty beverage. Sadly, Crispin isn’t available in Colorado yet (it’s coming this year!). But, they were kind enough to send me a sampler of their products to try. It was like Christmas! I’m going to break up the reviews to give me time to sample and write, so keep your eyes peeled if you too are a cider fiend. 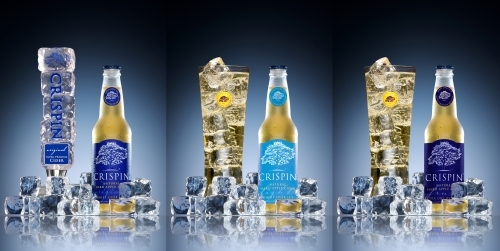 Crispin Super Premium Hard Apple Cider, designed to be enjoyed over ice. Inspired by the classical, refined flavor styles of continental European cider making, Crispin “Blue Line” ciders are clean on the palate, with a crisp, not sweet, taste profile. They are deliciously untraditional with a strong “apple bomb” bouquet, fresh appley mouth-feel and pure & clean lingering aftertaste. Our ciders are not styled as traditional “sweet beers”, they are not old-fashioned sweeter alternatives to beer, but sophisticated and crisp not sweet, dry and not “sticky” on the palate. And totally delicious over ice. Now, there’s an interesting point before I dive into the reviews. The label on each of these three ciders suggests that it be enjoyed over ice. That was something I’d never seen suggested for cider, so I asked the Crispin folks why they suggest it for theirs. To answer your question regarding pouring Crispin over ice, it’s something that’s done quite often in Europe and a lot of American’s haven’t caught on to it. I think it’s the preferred way and it tastes exceptional when enjoyed over ice (even in the frigid Minnesota Winter!). Sounds great to me! I’ll definitely be giving it a try. Especially once the weather warms up. On to the consumption! Nice clean aroma of apples. This is the sweetest of the three Blue Line ciders, but still what I would consider a dry cider. I found the Original to be the fruitiest of the three ciders with a full apple flavor. The crisp moniker is definitely deserved. This cider is light, fruity and natural tasting. Crispin also offers this cider as a draught, so keep your eyes open next time you’re at your favorite watering hole. Ever heard of a light cider? Neither had I. But, don’t think light beer; this cider is nothing like that. Crispin’s light cider has a subtler aroma and the flavor isn’t as full as the Original, but it’s a great cider. The flavor is lightly sweet with bright apple flavors coming to the fore. And, get this, despite its full flavor and sweetness this cider only packs 110 calories. I’ll take one of these over a light beer any day. English Dry ciders have long been my favorites. There may be a new winner though. This cider is dry and clean with a super bright apple in the aroma. The driest of the three Blue Line ciders the Brut packs a huge apple flavor and body. The Brut is the least sweet of the three and very reminiscent of some of the European ciders I’ve tried. Fantastic cider. These three literally can’t get to Colorado soon enough for me. Thankfully, I’m heading to Arizona at the beginning of March where I’ll be able to indulge my new-found need for Crispin Blue Line ciders. 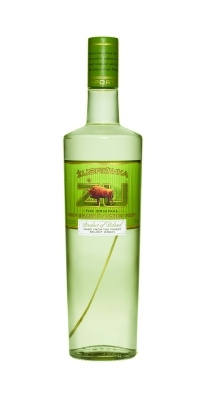 A bit back, I was offered a sample of Żu bison grass flavored vodka. Having seen it on the shelves a few times I couldn’t resist the chance to try it out. Before I get to reviewing the actual product, let’s take a quick look at what exactly bison grass and bison grass vodka are. Bison grass is a wild grass native to both North America and Europe. It has a couple other names that may be more familiar to some of you: sweet grass, buffalo grass, manna grass and vanilla grass. The grass has a distinctive sweetness which plays into the flavor of the vodka. Now, how about that bison grass vodka. Żubrówka, or simply Żu as it’s sold in the US, is a Polish vodka distilled from rye. After distillation the vodka is infused with bison grass extract and finally a blade of bison grass is added to each bottle. Żu has a lovely light yellow/green color from the grass extracts. As you bring it to your nose you get a mild herbal note, a touch of grassiness and a subtle sweetness. The flavor is truly interesting. Subtle sweetness and mild herbal notes, just like the aroma. The herbal notes are similar to a very light herbal tea rather than the flavors you find in herbal liqueurs. I would certainly drink this on it’s own or over ice. The flavors are complex and interesting without being overwhelming. Żu’s herbal notes are sure to play well in lots of cocktail applications. But I wanted to try something simple that would accentuate the vodka. One recommendation is to mix it simply with apple juice. I first tried with an equal part apple juice and found this mix to be quite good, but a little unbalanced. Next I upped the apple juice to two parts and found a real winner for me. The herbal flavors play off the fruitiness of the apple juice extremely well with neither stealing the show. I’m excited to try this in some other vodka classics like the Apple Martini and even a simple Vodka Tonic. If you’re looking for a new vodka for your shelves, give this one a go. I think you’ll find it intriguing. While the middle of winter isn’t generally the time you crave a nice, cold sour, I found this one to have truly been aptly named. 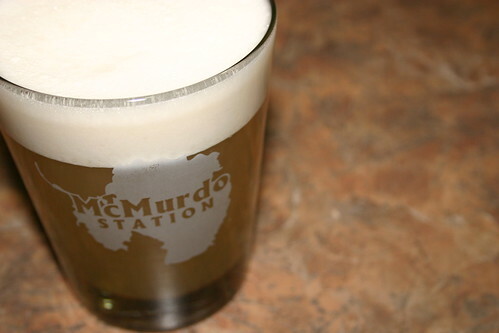 The delicious sour is nicely balanced, big, cold and frothy. First on your palate you get fruity hints of the apple and peach. Following that, I noted that it wasn’t nearly as sweet as I expected it to be, rather it was nicely balanced. Finally, the egg white gives this drink a tremendous mouth feel in the same way that it does with other drinks. There are a couple interesting points to be made, though. First, let’s talk peach brandy. If you walk into your local liquor store and go to the brandy aisle you’re going to get the same response that I did. Namely, peach brandy is kept over with the liqueurs and really isn’t a brandy at all. Peach brandy, as most know it, is a brandy based, peach flavored liqueur. At this point I’m certain some of you are saying something to the effect of “But, what about eau de vie?” and you’re absolutely correct. Peach eau de vie is technically peach brandy proper. However, after mixing this drink I’m certain that’s not what the author (“The Only William” Schmidt) intended. Without the sweetness of the peach brandy the drink would need additional sweetening to balance things out. Second, let’s talk lime juice. The original recipe in Schmidt’s Flowing Bowl and my source, Vintage Spirits and Forgotten Cocktails, calls for the juice of one lime. Being a details type of guy this wasn’t an exact enough measure for me so I did some experimentation. After that foot work (or should it be arm work) I can say that you have two options. If you prefer a drier cocktail go with 1 1/2 oz of lime juice and omit the sugar entirely (my personal preference). The resulting drink still has a mellow sweetness from the peach brandy and isn’t overly tart. If you prefer a bit more sweetness bump the lime juice up to 2 oz (which I did, in fact, get from one giant lime) and keep the tsp of sugar. The added lime juice balances the extra sugar. Lastly, I felt this drink needed some additional complexity. I found that complexity in 3 dashes of bitters. I used my homemade version of Robert Hess’ House Bitters, but you could use any aromatic bitter that you like. The spices play extremely well with all the fruitiness in this drink and really give the drink much more depth.